We connect individuals with specialized skills and talents to strengthen the infrastructure of a nonprofit. Ready to make a lasting impact? We connect passionate people with opportunities to serve. Our knowledge of the nonprofit's consulting needs allows us to make the perfect match for the biggest impact. Experts from human resources, technology, finance, marketing, real estate, law and other professions are needed to help nonprofits with specific projects. "BVU connected us to a Lean Six Sigma expert who led the transformation of several of our business processes. This transformation enabled both cost savings and additional revenue capture." Hear how an accounting firm convinced its employees they could change the world. Nonprofits need pro bono to sustain and grow their organizations to meet community needs. Attend this event to meet with experts in marketing, human resources, finance and employment law. BVU facilitates successful pro bono matches for the most rewarding experience for all. An individual tackles a specific project for a nonprofit. A team of individuals work on a customized project together for a nonprofit. Businesses host a Doctor’s In event for nonprofits focused around their core services. 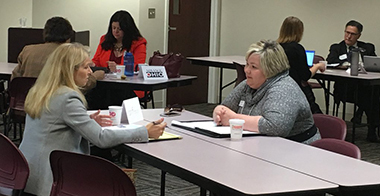 Nonprofits and business experts with various skill-sets participate in 90-minute consulting meetings at BVU's signature Doctor's In event.